Last year, Jerry Sandusky, a former football coach at Penn State university, was convicted of 45 counts of child sexual abuse. He is serving a 30- to 60-year prison sentence. 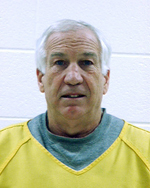 Now lawyers say there were errors in the trial and Sandusky should get a new one. Jerry Sandusky seeking new trial, on ESPN.go.com.